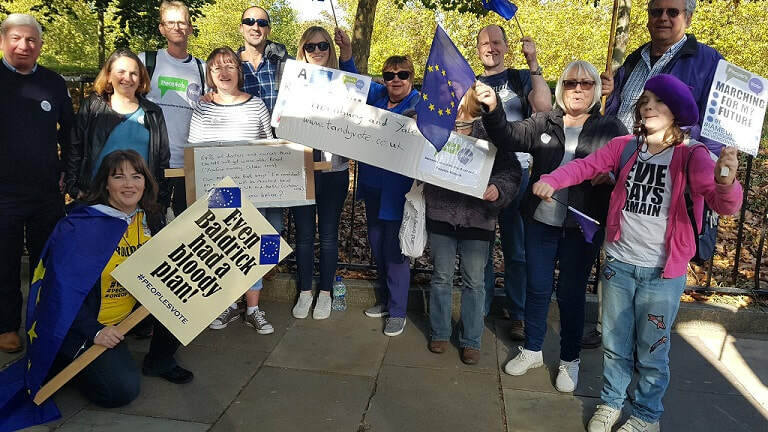 ​Our group hired a coach to join the People’s Vote March for the Future on 20 October 2018. An estimated 700,000 people took part, making it the biggest political demonstration in the UK since 2003! “As an NHS worker I went on the march as I’m incredibly worried about the negative impact Brexit will have not only on the NHS but the country as a whole. Since the referendum it’s become clear that the leave campaign was based on lies and deliberately misled the public. There will be no £350 million a week for the NHS. Instead the reality is more staffing gaps, concerns about medicine provision and likely more cuts. In a poll this month, 64% of doctors and nurses thought the NHS will get worse after Brexit. "As a doctor in the NHS I'm really concerned with how the NHS will cope if we leave Europe. I went on the march because people didn't know the true facts when they voted in the referendum. We didn't know that Brexit could cost us over £50 billion just to settle the divorce bill. We didn't know vast numbers of staff were going to leave the NHS to return to other parts of Europe. And we were told there would be an additional £350 million a week for the NHS if we left, which even Nigel Farage has admitted was a mistake. "The truth is we will be worse off and, more importantly, so will our children. Let the people decide the peoples' future now we know what we are voting for." "There is a Chinese curse that says may you live in interesting times, but these aren't interesting, they are destabilising and destructive. While we are all distracted by the concept of Brexit an environmental catastrophe is unfolding which we should be working with our European partners to resolve. "I also believe if Brexit happens we will see the break up of the United Kingdom over the next 10 years which is not something I thought I would see in my lifetime. There is no Brexit Happy Ever After - this is a disaster." ​The march was led by thousands of young people whose voices have often been ignored on Brexit. People of all ages were there, and at the finish in Parliament Square there were speeches from young people, doctors, business leaders and MPs from the Conservatives, Labour, Liberal Democrats, Greens and SNP.